Close to stores and restaurants pet-friendly and quite comfortable are just a few of the things our guests like about La Quinta Inn & Suites Jacksonville Mandarin. The three-floor hotel offers 99 spacious and stylish rooms equipped with free Wi-Fi coffeemakers ironing equipment cable TV and desks. Wake up to a free signature breakfast of waffles fresh fruit hot and cold cereals pastries bagels yogurt juices and endless coffee on tap. Hotel amenities include guest laundry facilities outdoor pool and fitness room. Pets stay free and parking is also without charge. 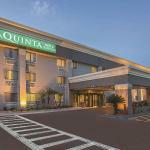 Located in Jacksonville's Southside Mandarin area conveniently located off I-295 La Quinta Inn & Suites is nicely situated whether you're headed west over the St. Johns River into Orange Park or east toward Jacksonville beaches. The La Quinta is located adjacent to San Jose Blvd. one of the area's main thoroughfares where you'll find every store and restaurant under the sun. NAS Jacksonville is just 15 minutes west. Downtown Jacksonville and all its attractionsâ? ?ranging from the Riverwalk and Jacksonville Landing to the Prime Osborn Convention Center and EverBank Field (home of the Jaguars)â? ?is 20 minutes north. Swing east and drive 25 minutes you'll hit TPC Sawgrass where the PGA plays golf and pristine Ponte Vedra Beach. Jacksonville International Airport is a bit of a hike 32 miles north of the property. Dogs up to 50 pounds are allowed. There are no additional pet fees. Dogs may not be left unattended, and they must be leashed and cleaned up after.